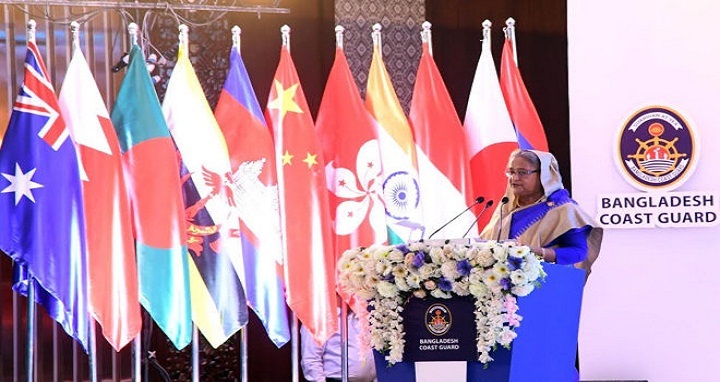 Dhaka, 24 October, Abnews: Prime Minister Sheikh Hasina today laid importance on finding ways and means for future improvements of the maritime security of Asia region through sharing experiences of different countries. “Maritime security is highly important for us as the life and livelihood of a large population in this region are mainly dependent on the sea,” she said while inaugurating the 14th high level meeting of the Heads of Coast Guards and Maritime Agencies (HACGAM) at a city hotel this morning. Sheikh Hasina hoped that through this meeting the member countries will be able to devise newer strategies in making their coasts safe and risk-free. Director General of Bangladesh Coast Guard Rear Admiral Aurangzeb Chowdhury gave the welcome address while Home Minister Aasaduzzaman Khan Kamal and Home Secretary Mostafa Kamal Uddin were present. Members of the cabinet, chiefs of the three services, parliament members, senior secretaries and secretaries and senior military and civil officials attended the function. Sheikh Hasina said there is a link between the development of human civilization and ocean. Early human habitation was built centering the seas or waters. “The importance of oceans can also be understood from the fact that 70% of the world people still live within 100 km of the coastlines. The nearer a society is to the ocean, the better is the life of its members,” she said. Saying that Bangladesh, a big delta, is fortunate to be connected with the Indian Ocean through the Bay of Bengal, the prime minister said Bangladesh has some 715 kilometers of coastline connecting 12 districts of three divisions. Sheikh Hasina said there is an abundance of resources in our sea and the extraction of which can serve us for generations. Hence, the safe and environmentally sustainable extraction of sea resources will make a great contribution to the wellbeing our people, she said. The prime minister said a safe movement of domestic and foreign sea vessels is also essential as 90 percent of our foreign trade is done through maritime transportation. Unfortunately, the sea areas are infested with crimes related to terrorism, drug-trafficking, gun-running, human-trafficking, illegal, unreported and unregulated fishing, piracy, armed robbery and many more heinous activities; she said adding that the threats are sometimes trans-boundary in nature. Moreover, the criminals use sophisticated technologies and machineries in committing their crimes. As a result, it is not possible to curb these crimes for a single country. Unified efforts of all can prevent these activities, she said. “A forum like HACGAM has given the opportunity to share our experiences of fighting maritime crimes towards achieving safer seas for all of us,” the prime minister said. Sheikh Hasina said Bangladesh Coast Guard was established in 1995 through a bill placed by her party in the parliament in 1994 while it was in the opposition. This is the lone entity in the country which was set up through an opposition party bill, she said. The prime minister said Bangladesh Coast Guard is responsible for ensuring safety and security of our sea areas. Despite being a young maritime agency, it has acquired excellence in ensuring security of vast sea area and has become the nation’s guardian in the sea. Sheikh Hasina said realizing the significance of the sea, Bangladesh’s Father of the Nation Bangabandhu Sheikh Mujibur Rahman enacted the Territorial Waters and Maritime Zones Act soon after independence to establish sovereign rights of the people on the sea and sea resources. “Bangabandhu also initiated the process of demarking the maritime boundary with Myanmar and India. A Memorandum of Understanding was also signed with Myanmar during his tenure,” she said. The prime minister said as a coastal country, the people of Bangladesh have myriad of interests in the Bay of Bengal. “We were obstructed in harnessing sea resources for four decades as there was no maritime boundary demarcation with two other countries – Myanmar and India -which have ownership on the Bay of Bengal,” she said. “The fishermen were obstructed to catch fish in our sea areas while people of other countries caught fishes unhindered,” she added. Sheikh Hasina said assuming office in 1996, her government ratified the UNCLOS in 2001 and through which a foundation of our rights to the sea has been established. She said after ratification of the UNCLOS, Bangladesh submitted its claim in 2011 to the UN on the continental self beyond 200 NM. After a long hearing, the Tribunal on the International Maritime Law gave its verdict in favour of Bangladesh, establishing its rights on 118,813 square kilometer area of the Bay of Bengal. Welcoming the heads of the coast guard agencies of this region, the prime minister said Bangladesh is privileged to host this prestigious meeting for the first time.